Vicki Mathison, already well-known for her wonderful illustrated materia medica for animals, is back â€“ to the delight of all her fans! This time, in collaboration with Frans Kusse, author of the very popular Homeopathic Types and Childrenâ€™s Types, she turns her keen eye and skilful pen towards humans, young and old. The result is a fantastic teaching tool for budding homeopaths, who will have the rare opportunity to learn the remedy pictures with a smile, as well as a useful memory aid for the more experienced among us. The expression â€œa picture is worth a thousand wordsâ€ has never been more true. 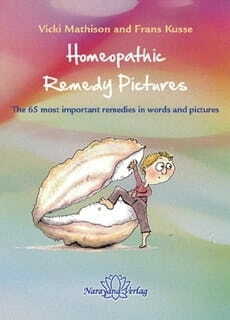 The pen of homeopath Vicki Mathison vividly brings the 65 most common remedies to life with often hilarious pictures. Her talent for portraying humanity in all its strengths and weaknesses literally shines on every page. With the eye of a true connoisseur, she sketches the most important characteristics, guiding symptoms, predilections and typical ailments. The Agaricus girl with superhuman powers, the split personality of the Anacardium boy, the typical weakness of the elderly Carbo vegetabilis woman, the stringy discharges of the Kalium bichromium type, and the fruitless bustle of the Theridion housewife â€“ all come alive to remain forever etched in our minds.